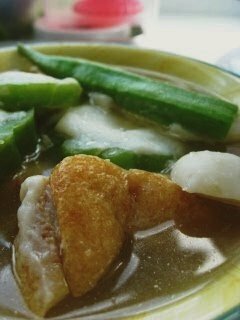 Yong tau foo is essentially a clear consomme soup containing a varied selection of food items including fish balls, crab sticks, bittergourds, cuttlefish, lettuce, ladies fingers, as well as chilis, and various forms of fresh produce, seafood and meats common in Chinese cuisine. Some of these items, such as bittergourd and chili, are usuall filled with fish paste (surimi). The foods are then sliced into bite-size pieces, cooked briefly in boiling broth and then served either in the broth as soup or with the broth in a separate bowl. The dish is eaten with chopsticks and a soup spoon and can be eaten by itself (served with a bowl of steamed rice) or with any choice of egg or rice noodles, or bee hoon (rice vermicelli). Another variation of this dish is to serve it with laksa gravy or curry sauce. Essential accompaniments are spicy, vinegary chili sauce, similar to Indonesian sambal oelek, and a distinctive brown sweet noodle sauce or hoisin sauce for dipping. Saute the yellow onions, dried anchovies and soya beans in 2 tablespoon of oil till the onions go transparent. Add the garlic, pepper corns and ginger and continue to stir till fragrant. Add the water, and allow this to simmer for about 3 hours. Bring the stock to a boil and add your yong tau foo. Boil for 4 minutes. Note: If you want to make your own yong tau foo pieces. It is possible. Just buy some firm white fish fillets with the skin off. Batang is a good choice. Put it in the food processor to blend till a paste, add some salt, pepper and corn flour to help it along. Cut up some vegetables (capsicum, okra, green seeded chilli, red seeded chilli) and add the fish paste on them. You can also buy some firm fried bean curd, slit a hole and stuff the fish paste in. Where to dine to usher in the Year of the Snake.??? This would be perfect for this weekend. Cant wait to try.. thanks very much!